Anyone who’s had the pleasure of spending long summer days jumping on a trampoline knows exactly how fun it can be. However, it’s not all sunshine and rainbows. Or rather, the sunshine is the problem! After all, we can’t have a carefree day on a trampoline without protecting ourselves against harmful UV rays. Other than the sun, there are many other reasons why you might want to get a trampoline shade or a roof. In this article, we’ll talk about all of them. In addition to talking about the conditions that might warrant a trampoline roof, we’ll also talk about how you can install one and some general trampoline shade cover ideas. Also, for the people who like to put in a bit of extra effort, we’ll present a great DIY trampoline roof project. Although it may seem obvious to a lot of us, there are actually several reasons why we might need a trampoline shade. 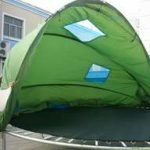 The various trampoline shade cover ideas we’ll list in the main section of this article will directly answer to different needs. So let’s see why outdoor trampolines need a roof. Sweeping leaves off a trampoline certainly isn’t the most exciting part of owning one. Fortunately, there are ways to avoid it. Having a trampoline cover to keep leaves off is a great option. If that’s your only concern, you don’t even need to choose a tinted trampoline shade. In fact, you can even improvise by hanging a net right above your trampoline and keep it at that. However, that certainly won’t protect you from the negative effects of the sun. Basically, there are two features you’ll want to look for when you’re shopping for an effective trampoline sun shade. For one, you can look for products that are marketed as “UV protection” covers. You also want to make sure that the shade is made of an opaque material. That should make the trampoline breezy and protect lucky jumpers from the sun and heat. If you want to have complete sun protection, we recommend adding a tinted safety net all around the trampoline. That would essentially block off the entirety of the trampoline. However, a trampoline tent would also be a fun alternative to this safety net and trampoline sun shade combo. Lastly, if you happen to live in a particularly rainy area, there are other adjustments you can make. For example, you should consider making a DIY trampoline roof with waterproof materials. Obviously, these types of materials would reduce the amount of airflow inside the trampoline. Still, you can balance that with breezier walls. Although, that may not be an option if you live somewhere where a downpour is always looming. 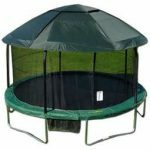 Now that we’ve seen all of the possible reasons why we might need a trampoline shade, let’s talk about some specific products we might use. The four ideas we have for you may not be particularly innovative. However, you can also tweak them by using various materials according to your needs. The first and the most obvious suggestion we have for you is to simply get a commercial trampoline shade cover. The one we have linked to is just an example of what a trampoline roof usually looks like. Essentially, the product you’d get includes enclosure poles and a polyester roof. The polyester should have some waterproofing features, and the particular roof we’ve linked to even has channels for moisture drainage. Still, that kind of wording doesn’t make us particularly confident that the material could handle real storms. So you can also use the product we’ve linked to as an inspiration if you want to make your own sun shade using sturdier materials. However, this sun shade is great for what it is. It should be fairly easy to install, too. In fact, if you’ve ever wondered how to shade a trampoline, you may find that the process is easier than you previously thought! If your trampoline doesn’t already have a safety net, you’ll need to get a trampoline sun shade with enclosure poles. Check that the poles are compatible with the trampoline in question so that you’re able to slide them into place and screw them in. After that, you’ll need ladders to get to the top of the poles from the outside of the trampoline. We recommend hooking one corner of the shade cover on a single enclosure pole and throwing the rest of the material onto the trampoline. Then, you can go around setting the rest of the corners onto the poles until you’ve come full circle. The result would be a completely functional defense against the sun’s damaging effects. However, if you want something a bit more fun, we have another suggestion. We don’t know about you, but we particularly enjoy creating a trampoline shade out of a decorative element. There are many great trampoline tents of all shapes and sizes — it’s just a matter of finding them. 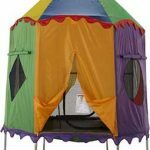 You can get one in the shape of a clubhouse, a tree house, or even a circus tent. An argument could be made that only people with kids could purchase those types of products. But hey, aren’t adults allowed to have fun once in a while? If you have no need for a whimsical tree house trampoline, you can always take inspiration from those types of trampoline shade covers. You can base your DIY trampoline roof on one of their shapes and build your trampoline tent using different materials. It can be as opaque or as transparent as you want it to be, with as little or as much airflow as you like. Ultimately, all of these choices are yours to make! 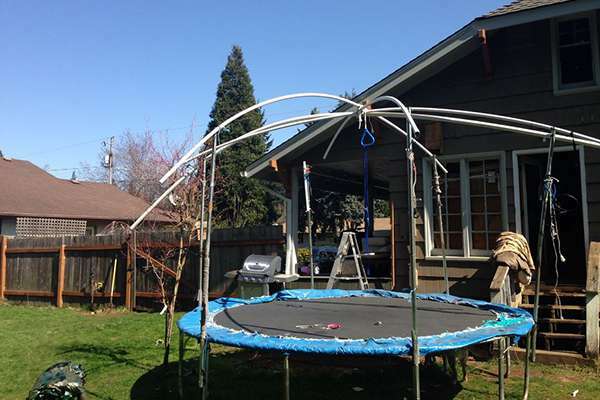 When we first saw this DIY trampoline roof solution, we loved the creativity. Let’s start by talking about what a sun shade sail is before we tell you how to make a trampoline shade cover out of it. As you can see, a sun shade sail is a simple stretch of high-density polyethylene. These sails can be rectangular or triangular, and we usually see them covering outdoor gardens of coffee places. The rectangular sails usually have stretched corners to prevent sagging. All things considered, they are actually a fantastic choice for what we’ve been looking for. Whether we need a trampoline cover to keep leaves out or to protect from various weather conditions, the polyethylene fabric will be very effective. As we’ve mentioned, not only is this material dense enough to allow rain to slide off, but it has built-in UV protection too. Furthermore, some products in this category come in a variety of colors and sizes. That’s just perfect for those of us who like our functional accessories to have aesthetic value as well. If you’re wondering how to shade a trampoline using a sun sail, we do have some tips. First of all, we recommend positioning the trampoline between trees or buildings that are slightly taller than the safety net. That way, you’d be able to use the trees and buildings to anchor the sail. We’d also set up the sail at an angle so that the leaves and rain can roll off and away from the trampoline. 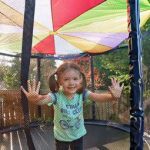 Finally, let’s talk about how to make a trampoline shade cover using a play parachute. You know what we mean — the huge circular piece of fabric kids pull up and down to create a parachute effect. A play parachute makes for a perfect DIY trampoline roof! Not only is it perfectly circular like many backyard trampolines, but it’s also colorful — which is always a plus. Besides, play parachutes come in almost as many sizes as trampolines. Typically, these parachutes are made of nylon. Despite the fairly dense material, the product we’ve linked to also has a mesh center that improves the airflow. If rainfall is a major concern, though, we recommend gluing a circular piece of nylon over the middle. Play parachutes also have handles that tend to line up perfectly with the safety net poles. Therefore, expect the installation process to be a breeze. Even if the handles can’t quite reach the enclosure poles, plenty of things might make up the distance. For example, elastic bands can be really helpful here, though you may also use regular rope or whatever else you have on hand. This DIY trampoline roof will provide a cover from the sun and prevent leaves and water from getting all over the mat. What could be better than that? There you have it! We spilled all of our secrets, from the standard trampoline sun shades to the best DIY trampoline roof we know of. But now, it’s time for us to hear from you. Do you have your own improvised trampoline shade cover ideas? Tell us all about them in the comments down below! And if you know someone who could really use all of this advice, please share this post with them!